A CPM Console + PDU Combo unit equipped with the Dial-Up Modem Option provides network administrators with a secure, reliable solution for remote access to console port command functions and power switching/reboot control capabilites at distant network equipment sites. When equipment outages disrupt communication with a remote equipment site, the CPM's onboard analog modem provides dial-up out-of-band access to the CPM, allowing support personnel to reboot unresponsive devices or reload routing tables. When a server or switch in a distant equipment enclosure suddenly crashes and takes down your network, the console access and power reboot capabilities provided by our CPM Console Server + Switched PDU Combos can help you to get your network back up and running again before users start to complain. The secure console access and remote reboot functions provided by the CPM Console + PDU Combo allow you to remedy most routine network issues without the delays, hassles and expense of a service call or truck roll. It's important to note though, that the console access and power reboot capabilities provided by the CPM are only part of the solution. In order to ensure that console access and reboot functions are available even during network outages, an effective solution for dealing with unresponsive network elements at remote sites must also include a means for Out-of-Band communication with the CPM Console + PDU Combo ... and that's why WTI offers the CPM with an optional Internal Dial-Up Modem. With the Internal Dial-Up Modem Option, support personnel can create a secure dial-up connection to the CPM Console + PDU Combo even when the network is temporarily unavailable. Tech personnel can quickly access the CPM via dial-up, and then invoke commands to reboot unresponsive devices, or access console port command functions on uncooperative servers or switches in order to tweak configuration parameters or reload routing tables and quickly restore network communication. 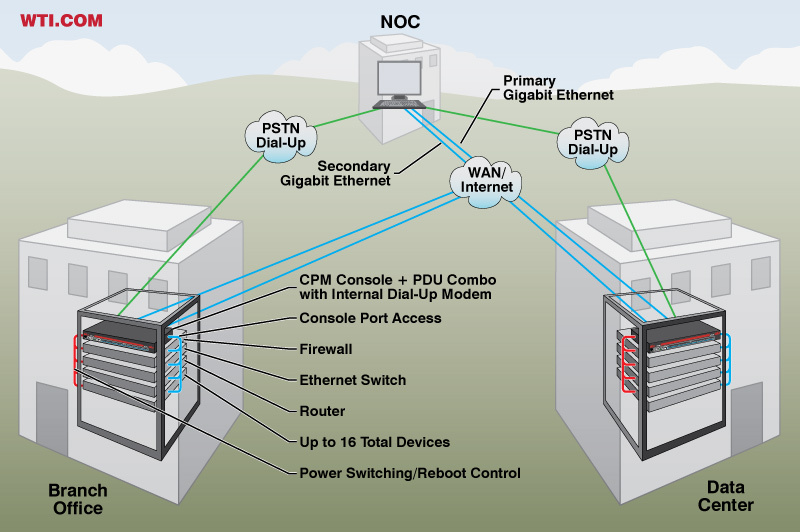 For applications that need more than one avenue for Out-of-Band access avenue to CPM units at remote sites, the CPM is also available with a convenient Dual Gigabit Ethernet Option, which provides two 10/100/1000Base-T Ethernet ports, allowing connection to both a primary network as well as a secondary, maintenance network. As shown in the graphic below, when both the Internal Dial-Up Modem Option and the Dual GigE option are present, support personnel have three channels for access to the CPM Console Server + Switched PDU Combo.